Trade Show Displays and Banners for Angela's Essentials from Farmington, New Mexico. Angela was in need of a Banner for her Trade Show Displays and Trade Show Display Booth. Angela found when it comes to Trade Show Displays, our Banner prices and services are the "Best On The Web!" Angela originally asked for, (and pre-paid for), a two foot by six foot banner that would work for her trade show displays. She will be exhibiting her Trade Show Displays and booth, (or exhibit), at the 2004 Rally in the Rockies. Her event is September 2nd-6th at Ignacio, Colorado. Angela's display banner was to have red lettering on white banner material that may be used for future Trade Show Displays. After several phone conversations, Angela gave us the go-a-head to use our discretion, and put together a banner using our experience with trade show displays. So what did we do for Angela? We put together a banner that she'll be able to use for many Trade Shows to come. 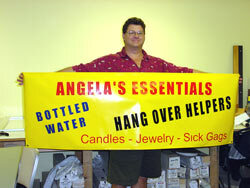 This display banner incorporates the elements of marketing to target her audience at the 2004 Rally in the Rockies.